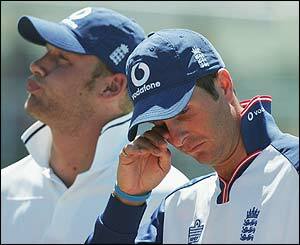 Can England's cricket failures learn from British Olympic success ? Will the England and Wales Cricket Board study the success of British Olympic competitors in Beijing and learn any lessons from them? More likely it won't even occur to the top people in the ECB that to make a comparison could be fruitful - in recent times the only comparative outsider at the top of English cricket (Ian MacLaurin) gave up in disgust. And one of the reasons was the cliquey, clubby insularity of the ECB board members all of whom had a vested interest in perpetuating the absurd 18 County system - a system that has so demonstrably failed to deliver. England has yet to win a Cricket World Cup and has abjectly failed in the last couple of World Cup events. England's one-day side is easy meat for almost anybody and we have failed to create one single One Day player of true quality (the imported Kevin Pietersen is not, of course, a product of the English domestic system). In the Test arena it is not much better. Again KP is the only player we have that other countries would covet. The ECB was blinded by the successes of 2005 and was bereft of a plan to build on them. In 2005 twelve players ably led and skilfully coached worked together as a unit for a few glorious weeks and managed to make the team bigger than its collective parts. Not one player has pressed on from 2005 (KP again excepted) and the 2006/07 Ashes tour was a shameful shambles. To succeed the inspiring and clever outsider Duncan Fletcher the ECB appointed a County stalwart in Moores who has done no more than preside over decline. Michael Vaughan has walked away from this whole farrago in disgust, and who can blame him? Back to the Olympics. The British rowers and cyclists and sailors and boxers are succeeding for a whole variety of reasons that the ECB could learn from. Well coached and motivated they also have a work ethic that would mean that they would look down with scorn on Pedallo excesses and their like. Every medal-wearing interviewee has paid tribute to his or her coach - and every coach has paid tribute to the efforts of their charges. That's why they win. There are no distractions like phoney dollar-spinning frolics in the Caribbean to look forward to - "just" the honour or representing your country. Compare that with, say, Steve Harmison telling England that he would personally pick and choose the games that he would appear in. And the ECB cravenly going along with this. But it does, as things so often do in sport, also come back to money. Whilst the ECB squanders its substantial resources from TV rights and ticket sales by handing them to 18 counties these very counties are in return contemptuous of the needs of England cricket in their selfish pursuit of spurious glory. So what if half a County team (or more) is not even English - that's better than the Arsenal isn't it? Can you imagine the British Olympic Association funding the development of athletes who are going to appear for another country and compete against Britain? Of course not. Then why do we tolerate this in English second tier cricket? It's amateur and insular and run by ignorant men with narrow vision. Thank God for the Olympics.